Ever feel like people aren’t really “getting” what you do? Frustrating (and very common, btw). And then there’s that experience when you’ve met someone in a networking meeting and you walk away thinking, “what the heck does he do?” File under forgotten. We’ve hired words that don’t work. Bad investment. If there’s anything I’ve learned in 3 decades of sales and marketing, it’s that words often just impact on the surface, or aren’t truly understood, or aren’t remembered. Words that don’t effectively communicate are just noise. But in the meantime, we have to strive for words that work. We need clarity. That’s as close to magic as we’re going to get. 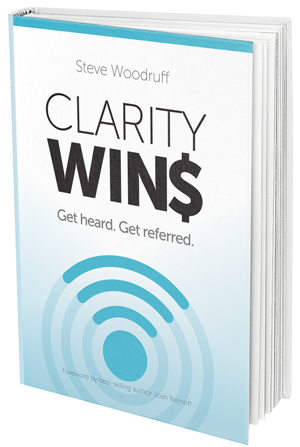 Business clarity consists two things: clear FOCUS, and clear WORDS. Your business…your strategy…your elevator speech…your website…your “pitch” – all need a foundation of clarity. No matter how big or small a company, no matter what industry – clarity can be your secret competitive advantage. This is exactly who we do it for. This is the business pain we fix. This is why we are unique and differentiated. This is where (geography/vertical/strata/function) we do our best work. AND….this is how we say it. Clear focus. Clear words that work. See that third bullet point above – “This is the business pain we fix”? Helping professionals and business get to clarity is the business pain I fix. I get together with you, and I listen, analyze, and brainstorm. We distill to 100 proof clarity, and craft the words that work. Let’s get started. Hire me for a one-hour session focused on your website, or your elevator pitch. I’ll do my magic, and you’ll end up with words that work. That’s a great investment. Can you think of anything more important to your success this week than having clear focus and messaging for your business?